“I would like this wiki to be a one-stop-shop for inspiration. All over the country, librarians are developing successful programs and doing innovative things with technology that no one outside of their libraries knows about. There are lots of great blogs out there sharing information about the profession, but there is no one place where all of this information is collected and organized. I originally got the idea for the wiki when I became frustrated by how large my Bloglines backlog had become as I’d bookmarked lots of posts with amazing ideas that I wanted to save for later (when they were more relevant to what I was working on). A blog is such an amazing medium for sharing information, but what do we do with the information once we’ve read it? Where do we collect it? In del.icio.us or Furl or whatever is the latest social bookmarking tool? In theory, people can find what other people bookmarked in del.icio.us, but in reality, with all the different tags we could use, it’s not quite so easy. And now there are so many social bookmarking tools that I find them more useful for bookmarking stuff for myself than in finding what other people bookmarked. I think a wiki is a fantastic place to collect all of these great ideas related to librarianship. All of those posts and websites you thought were brilliant. All of those successful initiatives you heard about. 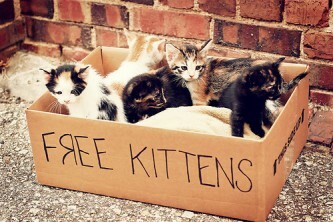 Wouldn’t it be great to be able to find it all in one place? So when you decide you want to bug your colleagues about switching to IM reference, you can easily find lots of posts and stories about other people who did the same thing. Knowledge-sharing has always been a passion of mine and a wiki was a good tool (at the time) for collecting knowledge from a diverse array of librarians across the world. In 2005, Facebook didn’t exist (to the public at least). Twitter didn’t exist. Google Docs didn’t exist. Google Sites didn’t exist. A whole bunch of other collaboration and CMS-type tools didn’t exist. 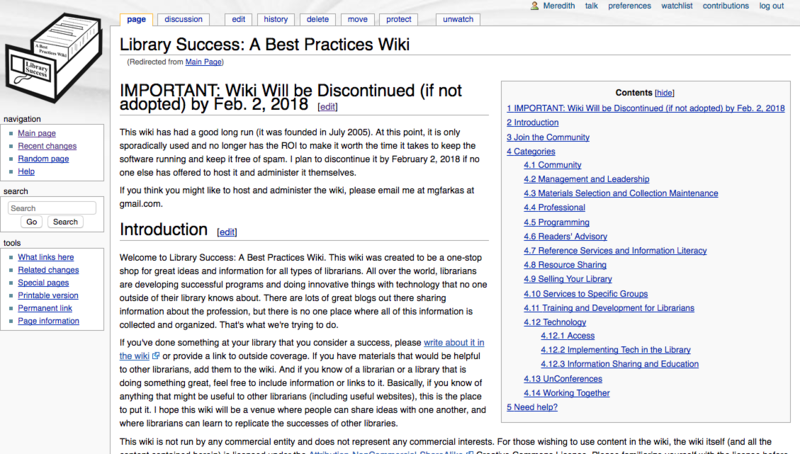 At the time, a wiki was one of the only free ways to collect knowledge from lots of different people, many of whom the person creating the wiki didn’t know. And it received contributions from thousands of librarians and certain pages were THE place to find information on that topic. But now, other more stable tools exist for this. Mediawiki software is vulnerable to spam and is not the most stable thing out there. I (and my husband when it’s beyond my capabilities) have spent so much time over the past twelve years troubleshooting the software, reverting spam, and blocking spammers. And, all the while, usage of the wiki has declined and many pages have become painfully stale and dated. With a heavy heart, I’m announcing that, unless someone else wants to run the Library Success Wiki on their own server, the wiki will be going dark on February 2, 2018. This should give people time to move information important to them to other collaboration tools and for a knight in shining armor who wants the hassle of managing the wiki themselves to emerge. 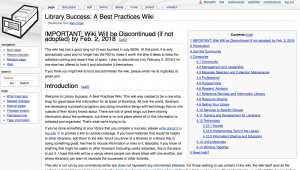 It can be hard to let go of services that no longer have the ROI they used to, and I’ve wrestled with the idea of saying goodbye to the wiki for years. It’s time. It’s past time. Feb 2017? Either this post was lost in the void all year or you meant 2018. I’m assuming the latter. Either way, a sad but reasonable decision. Ooops! I’ve fixed that to 2018. Thanks for the head’s up. Hard for my brain to even ponder that we’ll be in 2018 in two months.